Sometimes God Gives Us Something That Doesn't Make Sense. And it's Amazing. If I had to choose one thing to be thankful for this Thanksgiving Day, I would say Philippians 4:6-7. The Bible says, "Don’t worry about anything; instead, pray about everything. Tell God what you need, and thank him for all he has done. Then you will experience God’s peace, which exceeds anything we can understand. His peace will guard your hearts and minds as you live in Christ Jesus." Friends, this is a real thing. "Peace which exceeds anything we can understand" actually exists. It's a peace that doesn't makes sense when you do the math on your situation. It's where Jon and I have lived for 7 weeks now. If you enter this day searching for something to be thankful for, try praying. Seriously. Pray. Ask God to give you eyes to see His blessings. Big things. Little things. Things you haven't had the ability to see because "life"/your situation has left you with a thick cloud in front of your eyes. There is a whole world of Good that exists when you ask God to give you the eyes to see it. Then thank Him for those blessings. No matter how small they seem. (Can you blink? Well, thank God for a body that works in that way. Jon﻿ has learned the value of blinking and would tell you to be hugely grateful if your eyelids move.) :) Thank Him. Then tell Him your worries, wants, desires, fears, pain. Something supernatural happens when you turn your worries into prayers. It takes you off the anxiety hamster wheel and literally places your anxiety into the hands of your Creator God. The One who can actually do something about it all. When we put this into practice - the whole "worrying about nothing and praying about everything" - we experience peace. Not the 'peace' that comes with that 30 minute conversation with your best friend. Cuz that peace feels good. Really good. But it doesn't sustain. It's not the 'peace' that comes with that shopping binge either. I mean, let's be honest. That high feels great and really medicates us well. For a good hour or so. It's not the 'peace' that comes by indulging in that chocolate cake either. Or drinking that extra glass of wine. Or the 'peace' that comes when we gossip about other people. Oh, that's a good one. We feel so much better about our own junk when we talk about other people's junk. Their's is so much worse and ugly, right? That conversation feels really good. Until it's over. And we're faced with our own junk again. Then their junk really doesn't matter or help our situation at all. Friends, the peace that God offers - that the Bible talks about - that Jon and I are experiencing... is good. And complete. It lacks nothing. It sustains. And it makes absolutely no sense. It truly is beyond our understanding. But wouldn't you prefer a peace that is so whole and complete and supernatural that you couldn't conjure it up on your own? That it surpasses what you can explain or comprehend? Anything we can wrap our own arms or minds around isn't enough. It is finite. It will be flawed by just the mere reality that we are fallen humans living in a fallen world. Find true peace in the arms of an infinite God. A God who promises He will make you the best trade of your life. You give Him your worries, gratitude and prayer, and He gives you Peace, Shalom, in exchange. Even exchange? Not close. Does it make sense? Nope. But I invite you to try it. Well, God invites you in. I'm just here to tell you Jon and I are living in it right now and it's real. It's a thing. It exists. And to tell you that our list of "What We Are Thankful For" has never ever been as long as it is on this Thanksgiving Day. So friends, Happy Day of Thankfulness. If today doesn't come easy for you, fight for it. Pray. Express. Ask. Then feel. God loves you, I love you, and I love journeying toward Him with you. "Mom, you promised us that you would volunteer in our class every other Monday this year. But you haven't come one Monday. Why haven't you come?" My 7 year old daughter Taylor asked this morning during breakfast. "Well, because of everything that happened with daddy. And remember? We were in the hospital on 'Back to School Night' and that's the night parents signed up to volunteer." Long pause. "But remember that amazing photo album your teacher made for us? You got to take pictures of everything special to you at school and she printed it and put it in that beautiful book for you to give daddy in the hospital? That was awesome!" I replied in my super duper "look on the bright side, honey" voice. "I wish none of this happened." She said quietly. She didn't have an attitude. She wasn't being bratty. It was almost like she was saying it to herself. In that moment, I realized how much I had missed the mark in our conversation thus far. Jon was heading up the stairs and since he is deaf in one ear now, I realized he missed our exchange. I called for him to come back and join us. As he reached the bottom of the stairs, I looked at Taylor and asked her to tell her daddy. "I wish none of this happened." She repeated. "I wish none of it ever happened to you." "Us too, honey." I replied. "We wish it never happened either." "When are you going to be better?" she asked. Jon said, "Honey, I am better. Look how good I'm doing." He jumped up and down a few times, and walked a few steps, showing her how "normal" his body was functioning. "When is ALL of you going to be better?" She said as she waved her hand up and down, motioning his entire body. Before he could respond, she said, "Like, your smile. When will that be better?" Jon and I exchanged a glance. "Well," I said. Deep breath. "It might not get better. It might stay like this. We hope it will get better and we really think it is going to get better. But there is a chance that part will stay the same." We talked for a few more minutes, kissed Tay, and Jon went back upstairs while the kids continued to pack up their backpacks. I quietly slipped upstairs after Jon. "About what? Taylor? Oh honey. Absolutely. Taylor asks the honest questions. She makes the honest statements. I love that about her." Honesty. I'm learning it's one of the key ingredients in healing. Creating a safe environment where honesty is welcome. Another key. When Taylor first mentioned the fact that I hadn't been in her classroom as a volunteer, my first, knee jerk reaction was to point her to the roses. "Just look at those, honey. Don't think about those thorns that are digging into your skin.... the pain that you feel from those blasted thorns. Focus on the roses. You remember that photo album, honey. All those great pictures. Think about that. Think on that instead of the fact that your parents spent Back to School Night in ICU. Think about that instead of the fact that your dad was learning to walk again on a Monday, instead of your mom being in the classroom." As parents, we want our children to be happy. We want them to experience good things. We want the best for them. So sometimes when a bump in the road happens, we try to distract them. Focus their attention elsewhere. Because sometimes the bump isn't worth their time or energy or mind space. Truly. But other times, The Bump is actually a deal. A real thing. A divorce. An accident. A loss. An illness. And in an attempt to make sure everything is "good" and "happy," we still try to divert their attention from The Bump - even the Big Bump(s) - and try to show them the roses instead. We act like everything is A-OK, when clearly, Bumps are not OK. They are anything but OK. They hurt us and shake us and bump us and bruise us. They are painful. And as much as we don't want our kids to experience pain, they still do. "We agree. We wish this never happened either." Those 2 sentences were the best gifts we could have given Taylor today. She felt validated. And not alone. And she was given permission to grieve. Ah, there is another major key to healing. Permission to grieve. Our culture is filled with "good" people. "I'm good, thanks. How are you?" Do you remember that it used to be "fine." But who is "fine" anymore? I mean, really. Everyone is at least "good" right?? Unless you're not good. Or fine. Then what? Life is hard. Like, excruciating, sometimes. Painful and sad. And you know what? It's OK to say so. It's OK to feel so. I'm an imperfect person and an imperfect parent. But at the core of who I am, I want my children to find that I am a safe place to process. A safe place to be honest. I love them no matter what. So that's me. Imperfect, human being, me. How much more do you think our Heavenly Father is to us? 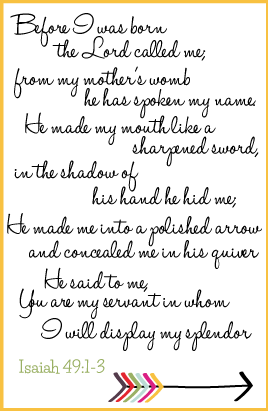 Our perfect, loving, good, powerful Father God. Friends, He can handle your honesty. He can take your frustration. He is a safe place. No need to fake it. No need to pretend that all you see is roses. He sees your pain. He knows your story. You don't have to hide your fear or your anger or your sadness. And because He intended for this world to have total Shalom, He will say to you, "I know. Me too. I wish this never happened either." This pain, this brokenness, these thorns, this Bump... this was not what God intended and planned. God created peace. Shalom. Things as it should be. Completion. And then came sin. And death. And disease. And destruction. So what does God do? Comforts. And loves. And offers grace. And brings peace. He causes everything to work together for the good of those who love Him... He is much more than just a listening ear. But start there. Talk. Be honest. And see what happens. You know what we did for Taylor? We celebrated Christmas. OK, not completely, but we decided this house needed some extra cheer. Stat. So we broke our own rule (of no Christmas before Thanksgiving) and busted out the Christmas decorations. The tree is up, the nativity scenes are out. We are reminded that God, Emmanuel, came near. God came near to us. To know us. To experience what we experience. (yes, even pain and sadness and betrayal and loss...) To live as an example for us. And to give up His life for us. Our family needed this reminder earlier than usual this year. We needed the hope of Christmas to invade our home today. We needed our kids to sense some joy. And somehow, God used twinkle lights and egg nog toasts to supernaturally heal our hearts. Perhaps you have experienced your own Bump. And perhaps you have tried as hard as you can to pretend it didn't hurt. To pretend you didn't feel the jolt. Didn't notice the bruises. Sometimes our healing is stunted because we aren't honest. We don't know if there's a safe place to be honest. And we haven't given ourselves permission to grieve. Don't minimize your Bump. Feel it. Mourn it. Grieve it. And then allow God to heal it. He will. And then go and be a safe place for others. Grieve with them. Feel with them. Then point them to Jesus. Oh, and don't miss those roses. Because they are there. He will show them to you. He wants to do everything with you... Hear the honesty. Heal the pain. Celebrate the healing. And delight in the goodness of those roses. And if it takes Christmas in November? Then so be it. Egg nog never tasted so good. Today started off with an incoming phone call from a random unknown number. Now I have to confess something to you: I have a deep 'fear' of picking up the phone from unknown numbers. Who will it be? What will they want from me? What if I don't want to talk about what they want to talk about and then I'm stuck? What if it's awkward? It's paralyzing. Now, I'm joking to an extent, but you get the point. ;) I'd rather have the person leave a message, listen to it, and then decide how to respond. (which is usually by text or email.) However, since I have become my husband's care taker, an unknown number could turn out to be any one of his therapists, a neurosurgeon, an opthemologist, etc.. So I am currently in the habit of picking up those unknown calls. This morning, however, the voice on the other line said, "Is this Deanna Ramsay?" "Um, yes it is." (this is where I'm secretly hoping I won some exotic getaway in some contest.) "Deanna, I'm calling from your Doctor's office. We sent your ex-rays to Radiology, and they found a tumor on your hip bone. You need to get in to an orthopedic doctor asap. We have a call out to your insurance to get approval for that referral. We will work on getting you that by tomorrow morning. In the meantime, you need to get your ultrasound. Oh, and we are pretty sure the tumor will be benign. But you need to get to a specialist. Do you have any questions?" I was so confused. Aren't these doctor calls supposed to be for my husband? You know, the one who had brain surgery 6 weeks ago?? For the past couple of weeks, I have been getting intense pain in my left hip. I am not a big "go to the doctor" person... or even a "take medicine" type person. When I get a head ache, I wait it out. However, I had been hobbling for several days and during one of Jon's speech therapy appointments while I was just sitting still in the chair next to him, the pain was just too intense. I excused myself from the room and stepped outside to call the doctor. They got me in the next morning - this past Friday. The doctor did x-rays on the spot and was looking for early signs of arthritis. But when they looked at the film, she said everything looked good. She then ordered me an ultrasound to check out my internal organs, but I told her the pain really does not feel like an internal issue. It really feels like a bone issue. But I made the appointment. For today. At 11am. But here it was, 8:34am, and I was being told I had a tumor. Ok, enough with the boring medical details. The reality is that the Church has done us a horrible disservice. Many cliche's and "feel good messages" rob us of the Truth of who God is. And one of the biggest lies we are told by well-intentioned people is: "God won't give you more than you can handle." (Insert huge shout out to Mike Erre, for teaching me this Truth a few years ago and debunking this long standing myth in the Christian church.) But let's be honest, we've all heard and/or been told and/or told someone else, "I know this is hard, but God won't give you more than you can handle. You will be ok!" But where, oh where in the Bible does it promise that? (hint: it doesn't.) It sure feels good though, right? But in the (paraphrased by memory) words of my brilliant friend Mike, "God DELIGHTS in giving you more than you can handle." Wait. What!?! "Because God lives at the end of your rope. Where you end, He begins. In fact, God does His best work at the end of 'you.'" Wow. Now that doesn't initially feel as good. The end of my rope is painful. And scary. And uncomfortable. I like my rope. My rope feels safe. And secure. Until I realize that this world is not safe or secure. Until I realize that this world has some crazy stuff in it... like disease, and destruction and death. Like divorce and pain and bankruptcy and fear and brokenness. And tumors. So what then? What happens when we realize our "rope" is gone. When we have nothing else to give. Nothing else to control. Nothing else to manipulate. Then... we find God. The Creator of you. And me. The One who probably sighs a deep sigh and says, "Oh my sweet child. I love you, but I am SO glad you are out of the way. You have been spinning plates, juggling your circumstances, manipulating life to your best ability. And trying to squeeze me into any space that might be left over. But now? There's nothing more you can do. The plates have fallen. The balls have hit the floor and are rolling away. "Life" has happened. And you officially have more than "you" can handle. But guess what? Fear not. This is not too big for ME to handle. In your weakness, I am strong. In fact, my power is made perfect in weakness. Perfect. In weakness. Let that just soak in. Oh, and don't forget that I am close to the brokenhearted. I will never leave you." Friends, this is good news. Great news. Because although I am so calm and confident that this tumor in my hip is going to be nothing at all, the outcome is still ultimately completely out of my control. And when you add this to the already huge season of life we are in with Jon's recovery, I think it is safe to say that this is more than we can handle. But you know what I feel? Relief. Ahhhhh. Deep exhale. I'm exhausted from spinning plates and juggling balls. I want to experience more of Him and less of me. I want to see His power in its perfection. And so I invite you to join Jon and me on this journey. You may not have a tumor, but I'm confident you have something. Something that you are trying so hard to fix. To make right. Something that is broken. Or painful. Something that you are trying so hard to make work. But it is completely out of your control. God is here. He is able. He can be trusted. He is good. And faithful. And if you want more of Him, you need to have less of "you" in the mix. So take that tightly clenched rope and let go. Pry each finger off one by one if you have to. And let the rope burn marks on your hands heal in the arms of a loving, good, powerful God. Jon and I are there right now. And trust me, His arms are big enough for all of us. Today we got to have an appointment with our neurosurgeon extraordinaire, Dr. Ched Nwagwu. I say "got to" because, well, we absolutely adore him. He not only is an incredible surgeon, he is a gentle, strong, humble man. We love him and secretly wish we could be friends in real life. How cool would it be to meet "our buddy Ched the brilliant neurosurgeon" just for coffee? I mean, really. Anyway, we got to meet with Dr. Nwagwu, get some amazing referrals to different specialists, and get an evaluation on Jon's recovery. To no one's surprise, Jon is doing remarkable. ;) Honestly, that is the word that the doctors and therapists have said about Jon's recovery and strength since Day 1. Remarkable. He is so happy with Jon's balance (not even needing his walker anymore), strength, speech clarity... there is a lot to celebrate! Dr. Nwagwu also used this handy dandy plastic brain to show us a glimpse of where Jon's tumor was. In this pic, he had taken the skull part off, then removed the brain, so we could see deep into the brain, which is where Jon's tumor was. He pointed his pen to the 7th and 8th nerves which are the little white things near the pen tip. The 7th nerve is the facial nerve and Jon's tumor was wrapped around it - intertwined in it. Ugh. Although he was able to preserve the nerve and leave it in tact, it is traumatized and only time will tell if it will function again. 1) Jon was accepted into the Outpatient Therapy Unit at Mission Hospital. He is currently scheduled to go 3 days a week for the next 8 weeks. He will be there for about 3+ hours at a time. Would you pray that he would get increased strength, stamina, and balance in his physical therapy appointments? Would you also pray that in his speech therapy appointments, they would see some type of movement on the right side of his face? Any signs of "life" will be an indicator that something is working and will give hope to restoration. 2) Jon has been referred to a neuro-opthemologist at UCI. We are unsure of if our insurance will approve Jon going to UCI - would you pray that they would approve it and that Jon would be seen by a trusted, respected, successful doctor there and would get in for an appointment soon? 3) While meeting with the neuro-opthemologist, we will discuss the option of putting a gold weight in Jon's right eyelid. We are told this type of surgery would give Jon the ability to blink that eye. If his facial movement is restored in the weeks or months to come, the weight can be removed or it can even stay, as it won't bother anything if it is there. The weight will provide him much needed functionality and pain relief. Please pray for wisdom for us to make the right decision on if we should proceed with this and for the timing for this surgery. 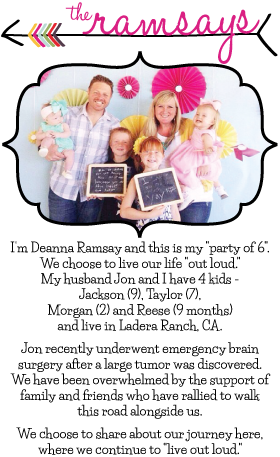 4) Jon has also been referred to an ENT that specializes in plastic surgery and restoration after brain surgeries. IF Jon's facial paralysis does not heal, there is a surgery they can do to restore movement in Jon's right cheek. It would consist of attaching the 7th nerve (facial nerve) to the 12th nerve (nerve that controls the tongue). Apparently when this surgery is done, it can allow the 7th nerve to function again to a certain degree. The ENT will determine how Jon is progressing and if/when this surgery would be necessary. Would you pray with us that Jon will not need this surgery? Our prayer is that Jon's face would be restored on its own over the coming weeks and months. 5) In 5 months, Jon will go for his 6 month, post op MRI. I know this seems like a long time away, but Jon's body is responding now, so I request prayer now. Dr. Nwagwu feels like he was able to remove 95-97% of Jon's tumor. Our hope is that the remaining 3-5% remains the exact same size. If it does, we will leave it and just monitor it with MRI's every 6-12 months. However, if it grows, Jon will have to start Radiation. Would you pray with us that the little bit of tumor left would not grow at all? 6) In addition, the MRI will be checking Jon's LEFT side of the brain. Unfortunately, when you get this type of tumor under age 40, there is a heightened chance that a "matching" tumor will appear on the other side as well. Now, the chance is very slight, but it is of enough concern to keep monitoring via MRI's every 6-12 months. If they saw the same type of tumor starting to grow on Jon's left side, they would hopefully catch it early enough that they would just do Radiation on it. We would NOT want to have surgery on it, since that would take away Jon's hearing on his left side as well - which would obviously leave him completely deaf. By monitoring it frequently enough, we feel very confident that even if a tumor started growing, they would absolutely catch it in time. However, would you please pray with us that NO tumor would grow on his left side? (like, ever.) Even though it is only a slight chance, we want to make sure it is covered in prayer. THANK YOU for being faithful in prayer. THANK YOU for being a safe place to bring all of our "stuff" and lay it out in honesty... The unknowns. The questions. The concerns. The hopes. The celebrations. THANK YOU for loving us enough to care and even read this far. :) THANK YOU for not letting us walk this road alone. We feel your love. We feel your support. We feel your prayers. Over the past several weeks, Jon's right eye has progressively gotten more and more painful and sensitive. Light has been a major factor since day 1, but any type of wind or even just air, has become the more prominent issue for Jon's eye. I like to put it this way: Imagine you and a 4 year old child engage in a staring contest. The person who blinks first loses, so you try your hardest to stare and keep those blasted eyelids open. We've all played that game at some point in our lives. And we all know the stinging sensation that hits us after not blinking for, oh, about 15 seconds, right?? Well, because of Jon's paralysis on the right side, his right eye doesn't really blink on its own. So you can imagine the pain and discomfort that would come with that minor detail. I mean, don't you think blinking is a minor thing? I always have. Who even thinks twice about blinking? We do it just as easily as we breath in and out. And yet the moment blinking is taken away from you, its value is truly introduced. We will be walking outside and I will think the air is perfectly still... But Jon is sensitive to even the slightest breeze and instantly the pain in his eye is just debilitating. It has been heartbreaking to see him like this day and night. So about a week ago, Jon began doing research on different options that might be available to him - something...anything that might bring some relief. He was thrilled to finally go to a Harley Davidson store and find these awesome sunglasses that have a special foam lining inside the rims. (Rims? Do you call them rims? You know, the plastic part of the glasses..) ;) It is similar to how a ski goggle feels and it really helps keep not only the sun out but the wind/air out as well. It seriously has been life changing! And can we hear a woot woot for the fact that they look like normal sunglasses and not like goggles?? I mean, he's hot in whatever, but it doesn't hurt that he found a pair he actually likes! Anyway, just wanted to share a "Praise" with you all and thank you for praying for his eye. It's a very temporary "band aid" that isn't fabulous, but it's a definite step in the right direction. And for that, we are thankful! On Halloween Eve, our kid's school had a "Monster Mash" Halloween costume party. Our kids were so excited to attend, so we loaded up the 6 of us and headed to the school for a night of chaos, I mean, fun. ;) We walked in the door, the music was thumpin, the decorations were awesome... it was a rockin party! All of a sudden, 3 little girls walked up to Taylor (our 7 year old) and said, "Hi Taylor!" They were friendly and excited to be there. I saw Taylor cross her arms in front of her and say, "Hi" in return, but with a bit of hesitation. She was guarded. She smiled at them, but you could tell she felt insecure. Her body language and "vibe" was so loud, I could almost hear inside her mind... Do you really like me? Do you want to be my friend? Is my costume cool enough? Am I accepted? Will you talk about me behind my back when you walk away? My heart broke for my sweet girl who for some reason felt so insecure. The girls fluttered away and our family continued to walk further into the room. All of a sudden, Morgan (our 2 year old) hopped out of her stroller and ran over to a group of about 5 little girls. They were obviously little siblings of school aged kids - just like her. They were dressed in princess costumes and Morgan was enthralled. She "oohed" and "ahhhed" over Ariel shoes and Cinderella gloves. She then grabbed hands with a couple of the girls and they all began to dance together in a circle. No one knew who Morgan was. She didn't know who they were. But no one cared. She had decided they were awesome and that a friendship was in order. So they laughed and danced and held hands. Complete strangers with zero inhibitions. No insecurities. No concept of what that would even mean. I couldn't help but compare my 2 daughters in that moment. What had happened? What happened between age 2 and age 7? And why, at the age of 35, am I resonating more with my 7 year old...and longing to feel the carefree courage of my 2 year old? There is something so beautiful about a young child. Something so free. Young children don't see handicaps, color differences, size, financial status... They just see human beings. What a breath of fresh air. I remember when our son Jackson was about 3 years old, we took him to a Christmas event at a community center in San Diego. Our dear friend Ken was going to be helicoptered in to the event, dressed as Santa, delivering goodies to all the kids. Ken is African American and I will never forget when he descended from the helicopter and Jackson ran toward him. "Santa!" Jackson yelled and ran into his arms. Ken hugged him and said, "Hi Jackson!" - our son was beaming. Jackson then ran to Jon and I and said, "That is so weird!" he exclaimed. "How in the world did Santa know my name?? He really is amazing!" Jon and I just had to laugh. Here we thought Jackson was about to ask why Santa looked different than the one he just saw at the mall. Nope! He hadn't even noticed. He just couldn't believe Santa actually knew his name. I love that! So we have these pure young souls who just want to play, love, laugh, and be. And then there's the rest of us. We still want to play and love and laugh and be. Except we can't. Because, well, what if someone laughs at us? What if they don't want to be around us? What if they judge us? What if they talk about us? What if they reject us? Ah, there it is. I realize that the thing Taylor has experienced that Morgan has not, is rejection. Taylor has felt the sting of rejection that we all have. So she hesitates to trust. Hesitates to believe the good. Hesitates to engage. I know that feeling. I even know that feeling at school. Does that other mom really like me? Does she think I'm a bad mom? Does that mom talk about me when I walk away? These feelings and insecurities hold me back from engaging with others at the level that I should. And those emotions also held Taylor back that night, from engaging at the level she should. When someone hurts you or betrays you, of course it is healthy to create boundaries with that person. We can forgive, but trust is something different. Trust comes back over time - after a track record has been established. My mom used to tell me when I was a teenager, "If you crash the car, I will absolutely forgive you. But I'm not going to hand you the car keys again right away." Trust takes time. There are some people who are pained by the hurt they have caused - they are remorseful and desire a reconciled relationship. The trust comes easily back. Then there are others who are just careless people in general. They are reckless with their words and their behavior. And so creating boundaries with that person and that relationship is very appropriate. Healthy boundaries are necessary. However, the rub comes when we encounter loving, healthy people, and find ourselves guarded. Those people haven't hurt us. They just want to know us and connect with us. But for some reason we can't compartmentalize the hurt from that past relationship. So we fold our arms, stand at a distance, keep others at bay. We've been hurt in the past. So we hold a bit of ourselves back the next time around, just to make sure we can't get hurt again. Painful, brutal cycles that get harder and harder to break. And in the end, the only one getting robbed is us. We miss out on deeper friendships. We miss out on uninhibited fun and laughter. We miss out on being known. After Jon's surgery and about a week into his hospital stay, he began to take account of different areas in his life. When you are faced with something that threatens to take your life, or at least something that messes with your life enough to shake things up significantly, you start to evaluate. Your relationships... your priorities.. He said to me, "I don't want my love for anyone to go unexpressed. I don't want anyone to ever wonder where they stand with me. I want to be generous with my love and make sure others know how I feel." As I think about all these insecurities we have and the walls we put up in our friendships, I think that very statement might be a huge key to breaking that cycle. You see, there is no way to get answers from every person for those deep seeded questions: Do you really like me? Do you gossip about me? Do you judge me? But what we CAN do, is answer that question for others. We can be the catalyst for affirming the good. Let no love go unexpressed. Verbalize gratitude. So often, we assume people know how we feel. We assume they know that we like them. How much we appreciate them. How much we value their friendship. But when left unexpressed, we leave margin for second guessing. We leave space for assumption. And when we assume something, we typically tend to assume the worst, right? Our insecurities trump believing the best. How cool would it be for me to love generously, and for the people in my life to know that? When someone knows you love them, they act different. Their guard comes down. They love more extravagantly. They care deeper. They trust more. They engage with less hesitation. Fewer walls. And when someone does those things, I can't help but believe it would perpetuate that for me. And for you. It begins to break the cycle. All because love was expressed. And sometimes, it's not that you didn't feel the love before. It's just that when you express it, no one has to wonder. No one has to guess. They can just sit in the good. Rest in the new found security. I believe this is the rule, not the exception - although the exception does exist. Like I said before, there are people in your life who have betrayed trust. Hurt intentionally and unapologetically. But I believe in this huge, vast world we live in, Good is so prevalent. And those who haphazardly cause pain are far less common than those who truly desire to love and be loved. So the opportunity to let other in, is there for all of us. The opportunity to express love is ever present. We just have to be the courageous one to make the first step. Say it first. If you're married, you know how this goes: He says, "If she respected me, I would love her!" and she says, "If he loved me, I would respect him!" The vicious cycle that kills many marriages. At some point, someone has to make the first move or else the marriage is stuck forever. At some point, one person has to act first. And once the "silence" has been broken, a beautiful new cycle begins. One of loving, and respecting, and serving, and giving. No walls. No guarded hearts. Just generous lovers. This is what I want to encourage my sweet Taylor toward in her friendships. It's what I want to lean into in my relationships. It's where 2 year old Morgan lives right now. "Oooo! Your dress is so pretty!! Hold my hand! Let's dance!" Beautiful. It's what Jon is journeying toward post surgery. He came to my community group this past week - a group of 40 young moms from our community. He thanked them and even cried in gratitude in front of them. They don't wonder if he appreciates them. They don't wonder where they stand with him. We can't change the past. We can't undo the relational hurt we've experienced. But we can move forward toward healthier, deeper relationships. We can uncross our arms. We can lean in. And the more we do, the more we will feel freedom. Freedom to be ourselves. Freedom to believe the best. Freedom to love and be loved. Freedom to know true community. This expression of relationship is so beautiful. So healing. So right. Let's say it. Let's express it. Let's live it. Let's show it. And then let's hold hands. Believe the best. And dance.